Tiger, Wolf, Bear, and Jr. Webelos uniforms are the same except for the hat, the neckerchief, and the neckerchief slide. We also add on the Webelos Colors this year. It is OK to use solid blue navy pants instead of the offical scout pants. 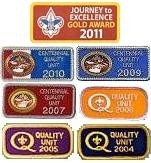 To get an idea of pricing, or to order items online, visit http://www.scoutstuff.org. This is the official online scout shop. They should have the same prices as our local scout shop in Suffolk County or Nassau County.